See who viewed your business and your products, get your premium badge and get your business listed higher in our search rankings. We are one of the leading manufacturer of Ladle Pre-Heating Systems up to 300 ton capacity. 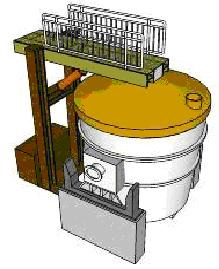 We have developed highly efficient REMSO-IIP Oil Burners and Ladle Heating Stations. These are operating in all the major industries in India We manufacture hydraulically or manually operated vertical ladle heating stations and trolley mounted horizontal ladle heating stations. These systems are provided with / without Recuperators. CERAMIC FIBRE for the lining. Supporting Documents No supporting documents found. You must login to send private message.